We adopt our dogs all over the U.S.! Adoption fees for out of state adoptions is $575 for most of dogs, which includes all vetting and vaccinations, a health certificate, special travel carrier, and air travel via United Airlines PetSafe Program. Contact Celestine Khuong at 832-659-2576 if you live outside of Texas! A beautiful silver Pitbull wondering this neighborhood. An elderly lady found her taking care of her, but she did not realize that the Pitbull was pregnant and give birth to 9 beautiful puppies. And that is ours mother. Mom have seven of us. Athena, Calypso, Delphi, Electra, Hera, Juno and Selene. We all love to play, jump, chasing each other and sometimes we get in trouble because we play rough with each other. We know all the basic command. We are ready to find ours furever home. Would you consider open your home and heart for us? 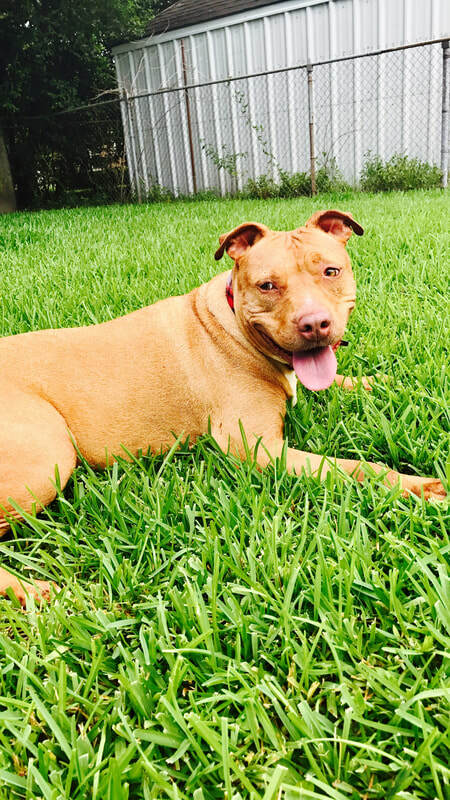 Fiona is a red nose pit bull, saved from the streets of the Fifth Ward in Houston, a rough neighborhood with a real stray dog problem. She is a big beautiful, and well-muscled female. She is about 2 years old, spayed, and up to date on all vaccines. She is Heartworm Negative. Fiona loves to hang with her people. She gets along with other dogs, but is BEST when an only dog. She wants the attention all to herself. She is about 70 lbs of loyal lovebug. If you want a loyal and playful companion, Fiona may be your girl. She also has gorgeous reddish-green eyes. 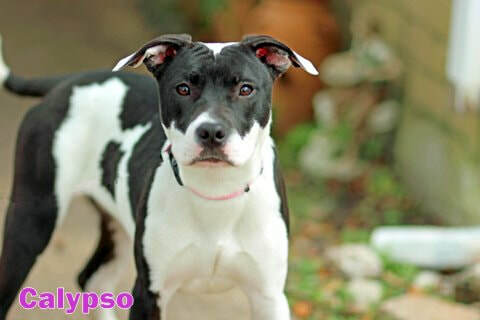 Misty is a sweet Pit mix with American bull dog that has been living way to long in a kennel environment. She has been longing for a home of her own. She's been living in boarding for almost two years now. She just wants what all of the other dogs have, which is a human(s) of her own and her own home, toys, bed, and people. If you have a special place in your heart for Pits, please consider Misty. She was taken away from my previous owner as they were abusing her and was using her as bait dog. Very nice ladies rescued her but she can’t give Misty a home. She contacted these ladies call themselves Angels Four Paws. Angels Four Paws are truly Misty earth angels, as they came to her rescue. She have been spay and completely vetted, so she is ready to start her new life. She will lick your face and be your best friend – Misty is such a good girl – very willing to please and learn. Hi there! My name is Blue. I have a family before but now I don’t. I am not sure why one day my dad put me in the back of his truck and drove around town. And when he finally stops he left me at this very scary place. There are so many of us in this building and I was terrified. But soon a nice lady came took me out of that horrible place. I was adopted when I was a pup. We have a good time and I was a good dog but my family dumps me. I am a handsome boy and a good boy but right now I am just still scare but if you give me time I will love you and be your new best friend. He is nervous about all the changes he has been through lately. He wants badly to have a friend to dote on him but earning his trust will take a little time and patience. But blue is ready to be someone's best friend. I am shy at first but I will warm up to you. 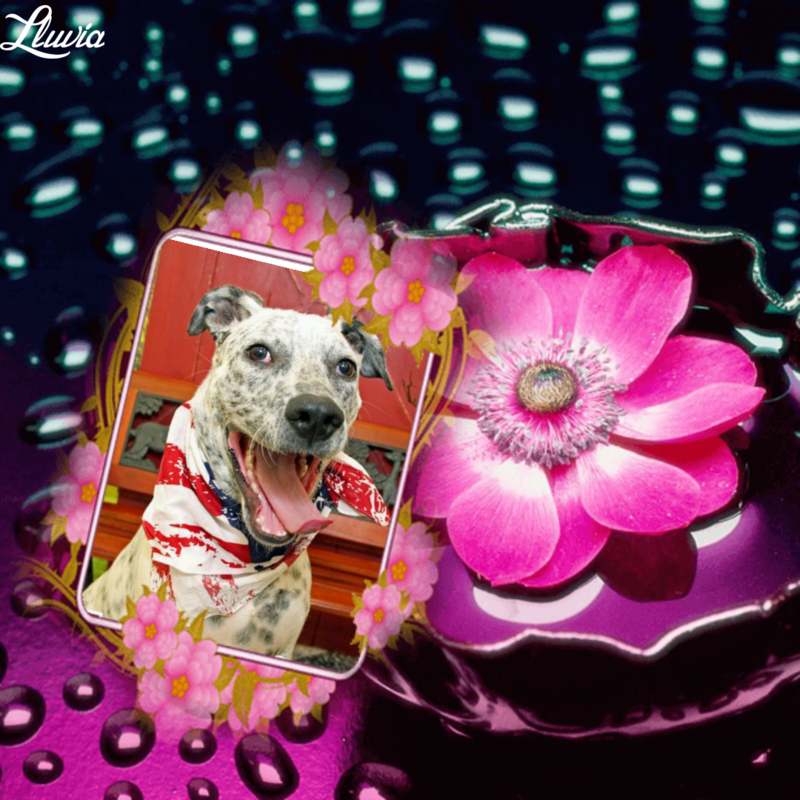 I am ready to find my new furever home won’t you make my dream come true????? The Angels LOVE me very much and want only the best for me. I am a love and very sweet boy, so won’t YOU consider taking me into your home forever and ever – making my dream come true! I will lick your face and be your best friend – very willing to please and learn. I have been with Angels Four Paw for over 6 months now and it is time for me to find my own forever family again. Hello! My name is LLuvia and I am 6 months old. 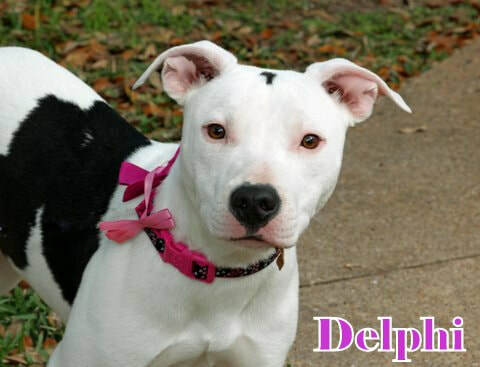 I am a Dalmatian/Pitbull mix that loves to play, run, chew on toys and be happy. My foster mom found me on the streets when I was a month and half, so she took me home and brought me back to health. Even though my foster mommy loves me very much she is not able to give the proper care that I need so that’s why she is looking for a nice new family for me. Recently my mommy discovered that I have hearing problems, so sometimes I might play a little rough, and I cannot hear very well when you call my name but if you give me patience and time I am a good girl and active family with a yard would be best for me because I need a lot of exercise. Because of my hearing problem I might play a little rough at times, so I cannot play with smaller pets because they might get scared. And kids are ok as long as you let me get accustomed to them. 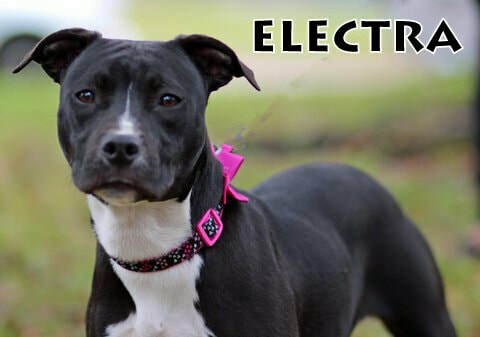 Because I am a puppy and my foster mom work a lot I am not fully train yet, and potty training is still a little hard for me, so I need a family that will have patience to teach me and train me fully. All my shots and check-ups are up to date and I am spayed and microchipped. Thank you for taking interest in me, I promise to love you and care for you if you give me the chance. 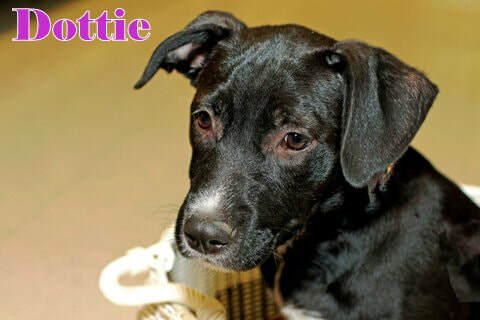 This sweet girl is Dottie is 5 months old with a beautiful shiny black coat. She was dump in the ditch in front of her current mom house. When she was rescue she was only 10 weeks old. I can’t never understand why people threw away these babies like they are a piece of trash. Dottie is full of life, love to play outside when it is nice outside and sleeping on her comfy bed. Her Foster Mom says she is very sweet and a totally love attention you are giving her. Her day consists of lounging, chasing squirrels, and then relaxing in the sun. She loves to cuddle under the covers and is happiest when she is touching her human. She is fine with other dogs but would do well as an only dog too. Hello! My name is Tag– I am 5 years old – Lab mix. I was found inside a private property a ranch which the owner was not sure how I was able to get inside. I had been living in front of their porch for a month or so I think. I was hungry cold shivering in front of their porch. The owner wants me out of their property so they contact a few rescue groups to come and take me away. And my next choice will be a shelter. A very nice lady hears about my situation she contacted several rescue group to help me. They also realize I was about to have my pups. She immediately tries to find help for me and my unborn pups. She contacted these ladies call themselves Angels Four Paws. Angels Four Paws are truly my earth angels, as they came to my rescue. If it was not for these angels my pups and I will not be here today. Although I am a little shy at first, I will quickly warm up to you, once I realize we are family and I am in my fur-ever home. I am full of energy ready to walk, play and run with you but also I love to cuddle – I am good with other dogs once I realize we are family. And all people – adults and children. Some of my favorite things are taking walks and lying in the sun. It has been such a long time since I have had my own home and family – won’t you consider me for that position? I have been spay, completely vetted and microchip, so I am ready to start my new life. Won’t you join me – we can make wonderful memories together. I will lick your face and be your best friend – I am such a good girl – very willing to please and learn. I look forward to your visit! Even thought I am in Houston Texas it will only take a few hours for me to be with you and become a part of your family. I have been with Angels Four Paw for 9 years. Because of my circumstances it is hard for my mom to find a match in heaven home for me. But I know there is a perfect furever home for me out there. Support our rescue efforts in Houston and surrounding areas by making a monthly donation!